I'm not sure how to make the images load directly, but this link should take you to some pictures of the new concert full set I received from Makoto Nakatsui about 3 weeks ago. Macassar ebony with Turkish boxwood mounts, Itaya maple for the mainstock. Japanese oak bellows. Four-key chanter with stop key. Folded Taylor-style bass reg. 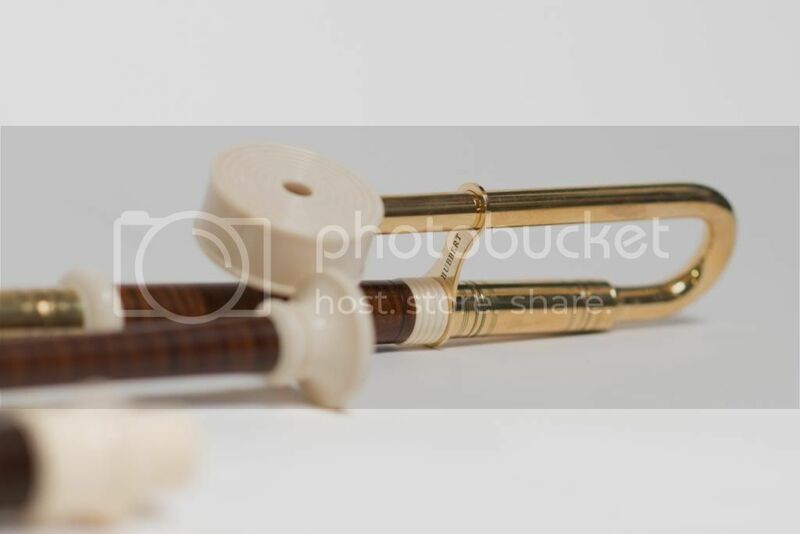 Cane chanter reed, composite drone reeds, spruce reg reeds. They are astounding! I couldn't be happier, and Makoto is an absolute pleasure to work with. I feel so very lucky. it looks beyond wild...what a set! congratulations! beautiful!!!! look like nice bellows price? They look just like mine! Then Again they are made by the same person. Only difference is the tube and my intake is made of imitation ivory. Did you get the bellows from Lawrence Thomson or from pipermaker. What type tubing are you using with bellows. I will be getting another black flexible tubing from kellehertrad.com as Lawrence Thomson supplied the clear tubing. 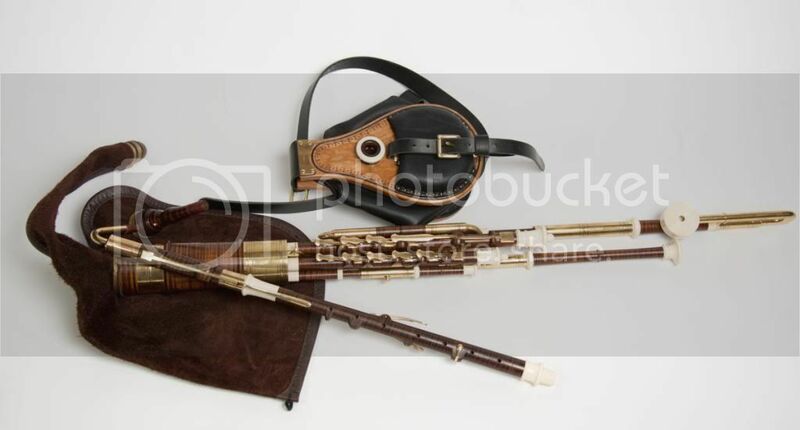 I got the bag and bellows from the pipe maker when I ordered a C# Lawrence/Hunter chanter. I have the same bellows but in black. I hadn't realised that my previous bellows were so inefficient/pants until i got these. 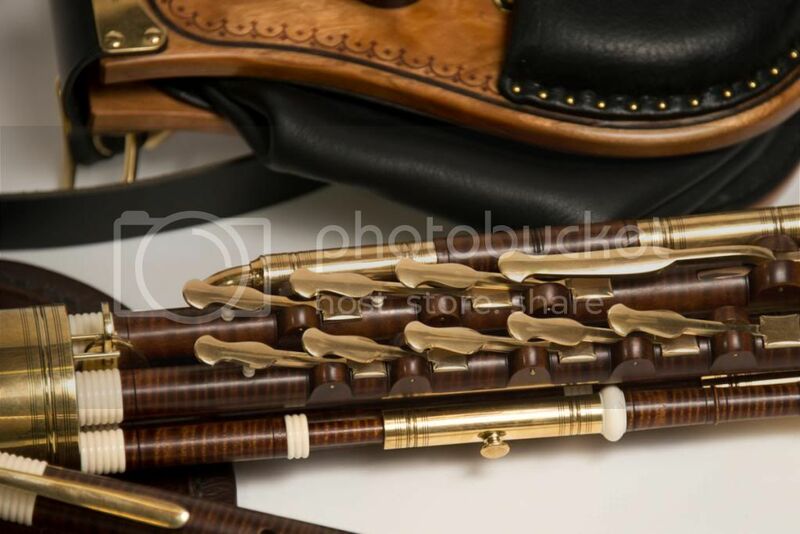 A few shots of my new 3/4 in B by Michael Hubbert. The set is in stabilized acid-stained domestic maple with mammoth mounts and brass. This set is based on Egan but has been brought up to modern B. It's got some great innovations including Taylor-style sliding drone shutoff, reg and chanter reeds are all the same dimensions. This beautiful belle made her debut at the SOCAL tionól and wowed. After a final voicing and finishing up the chanter keys it was shipped back here to the cold and dry midwest winter. The chanter, regs and drones immediately played in tune without any tweaking. I am extremely honored to play such a beautiful set. If you want to dance with this lovely lady time to plan on a visit to the GNIPC tionól this coming September. Mark your calendars! Holy Christ - I'd never have expected maple can look like THAT! A few shots of my new 3/4 in B by Michael Hubbert. That is a gorgeous set! Would love to hear them played. Lovely work. Is the coloration a result of the grain in the maple or of the acid? 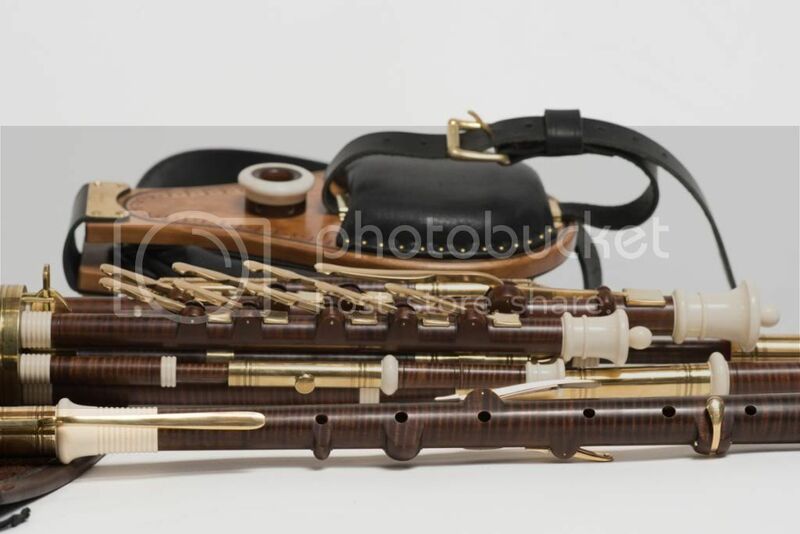 Your new pipes looks like snakewood used and made by Andreas Rogge.